The past few years have seen a growing interest in the short but hugely influential life of the Irish hunger striker Bobby Sands. Last year the film Hunger by the award-winning artist and director Steve McQueen, and starring the hugely talented actor Michael Fassbender, won many plaudits and awards, including the Caméra d'Or at the Cannes Film Festival. The film is a stunning and unforgettable piece of cinematic art. I can think of few films that have managed to deal so artistically with such a deeply intense political issue – the 1981 Irish Hunger Strike and the human courage, political conviction and personal suffering of Bobby Sands. The film shows the extent to which artistic endeavour can contribute to and deepen understanding of human political action and how less, in terms of dialogue and cinematography, can mean so much more in terms of cinematic impact, insight and value. 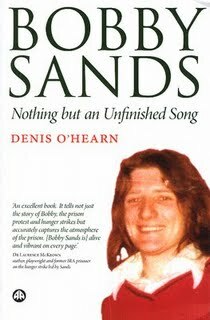 Two years previously my friend Denis O’Hearn published the first comprehensive biography of Bobby Sands. Below is a short review I wrote about the book at the time and which was published on Amazon.co.uk. This book is superb and should be read by anyone with even a fleeting interest in Irish politics and events. As a biography it is a wonderful account of one of the few truly great 20th century Irish political icons. As an historical record of political change and development in the Irish Republican movement in the 1970s and 1980s - the repercussions of which still resonate today - and the unique role played within it by Bobby Sands, it is an extraordinarily detailed, formidable and unmatched piece of political, social and personal research. And yet the book is also an enthralling read, breathlessly taking the reader through the tumultuous times of one man and his far too short but generation-changing life. Many, many books have been written about Ireland. Very few have achieved the level of empathy for the subject as Nothing But An Unfinished Song. The Sands' family should feel proud and hugely indebted to the author for placing Bobby Sands in a pivotal position in Irish Republican struggle.